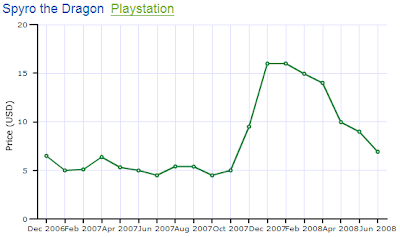 What happened to Spyro games for Playstation between October 2007 and January 2008? 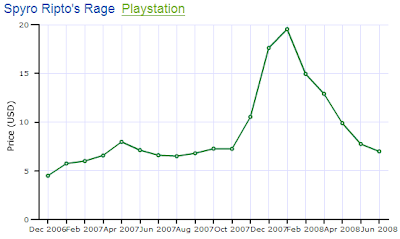 The resale prices for every PS1 Spyro game increased by at least 100% during this time. At first I thought it was Christmas, but Christmas 2006 (the far left side of each chart) shows almost no price change at all from December 2006 to January 2007. 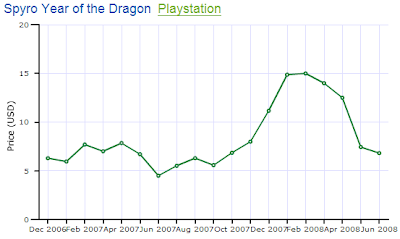 So it isn't just a seasonal increase in demand for Spyro games. Spyro Enternal Night was released in October 2007. Is that the sole reason for a price spike of more than 200% in some cases? If you have any other ideas for what caused this huge price increase last year let us know by leaving a comment. According to Google Trends there was a huge spike in searchs for Spyro at the same time as the spike in all the sales: Check it out here. The weird thing is there is no mention of why there is a spike. There was a new game announced in October for mobile phones and in April a new game announced called Dawn of the Dragon. Thanks for the google trends data Tanooki. That is interesting to see for sure. 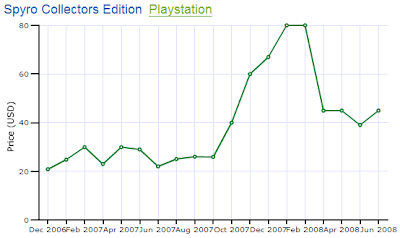 Check out Crash Bandicoot Prices as weel over the same period. Both games, at least their PS1 offerings, have followed a similar trend. Great Site by the way.